Small businesses are the engine of Britain’s economy. While news headlines are often dominated by big firms and household-name brands, 96% of all British businesses actually employ fewer than 10 people. One in three of us work at these smaller firms. Our mission at Square is focused on serving small businesses. While companies of any size can use and benefit from Square, we believe that by helping small businesses accept card payments, we can help them to keep growing in an increasingly cashless society. That’s why we wanted to speak to small business owners to understand what they’re thinking about the business landscape in Britain today. And in particular, we wanted to size up the potential that this vital part of the UK economy has for further growth. The majority of the cities we surveyed are confident about their business environment over the next 12 months, whether in terms of investment, hiring, expansion or revenue growth. On average, small businesses expect to grow by 29% over the next 12 months – massively outperforming the wider economy. Small businesses in Belfast expect the highest growth rate, on average forecasting they will grow 41%. Belfast businesses are also the most positive, with 73% describing themselves as confident about their business environment. In only two cities out of 15 – Glasgow and Sheffield – are businesses on balance more pessimistic than optimistic. When it comes to entrepreneurship potential, London is the leading city, with almost one in five people (18%) in the capital thinking about setting up their own business in the next five years. Next comes Edinburgh (15%) and Leeds (14%). There’s a well-established link between small businesses who adopt new technologies and those who then go on to perform strongly. So we asked small firms about their appetite for using technologies such as mobile payment systems, internet-based communications tools like Skype and business software. We found that Liverpool is the city with the small businesses most open to starting to use these technologies, with an average of 49% of firms, across all of the tools, happy to consider it. Belfast is the top city for currently using these technologies, with an average of 41% of firms using them right now, far ahead of Cardiff (34%) in second place. Meanwhile Leeds’ small businesses are the lightest users, with just 13% of small companies in the Yorkshire city using digital tools. Overall there’s a huge opportunity here for boosting small business growth, as in only a couple of cities do more than half of firms use any of this technology at the moment. Access to high-quality broadband is a key enabler to business development. According to MPs, poor internet connections cost the UK economy £11billion a year and 42% of SMEs report experiencing problems with their broadband speeds. Bristol tops the table with the fastest broadband, according to Ofcom, with an average speed of 33.8/Mbps. Broadband speeds vary drastically across our 15 cities: for example in Norwich the average is just 17/Mbps, almost half the speed of Bristol. Support networks are also especially vital for small firms who often need advice and help as they grow. London leads the list for the number of start-ups established last year: 213,000 were set up there in 2016. But Norwich actually has the most start-ups per head of population, at 167 per person. We know from our Confidently Cashless research that a majority of British shoppers (58%) prefer paying by cards than any other form of payment, yet 3.1m small businesses around the UK still don’t accept card payments. More than two-thirds of consumers (67%) in Southampton and Sheffield told us they would buy more from local small businesses if they accepted card payments. Overall, 20% of shoppers in London and 19% in Cardiff say they plan to shop locally more in the next 12 months. Meanwhile shoppers in Belfast and Newcastle are most loyal to their local businesses right now, with 54% and 48% of shoppers, respectively, currently shopping there. Bringing all four factors together, we’ve created a table ranking the 15 cities by the potential their small businesses have for further growth. Belfast comes top of our list, closely followed by Nottingham and Cardiff. Northern Ireland’s capital has a very optimistic group of small businesses, with the most ambitious growth plans and highest levels of confidence in their business environment. They also have the highest levels of technology use, plus an incredibly supportive base of consumers. 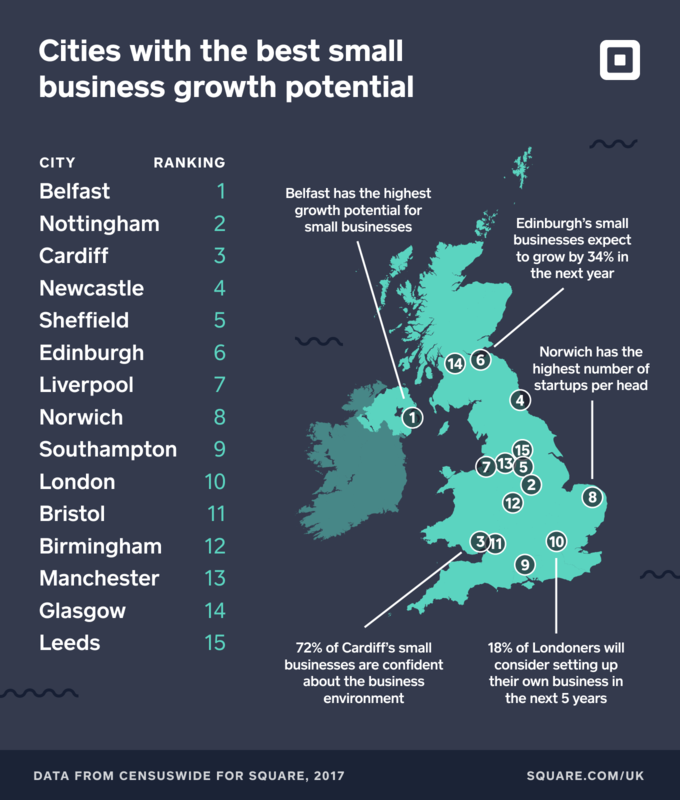 Meanwhile London was in 10th spot, mainly because its small businesses are not as enthusiastic in embracing technologies that can support their growth. This report underlines once again the crucial role small businesses play in driving the UK’s economic growth – and the enormous potential they have to keep booming. We look forward to playing our part in supporting Britain’s small businesses as they innovate and develop in the years ahead. Square commissioned a nationally representative survey of 2,044 consumers and 1,202 owners of small businesses around the UK, conducted by Censuswide between 15 - 24 August 2017.